February 1, 2019 8 comments on "Homemade Au Jus Mix"
Au jus mix is a new family favorite at our house. 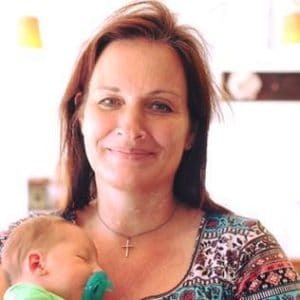 I have been trying out lots of homemade mixes, and have found that there are so many different mixes you can make yourself that taste better than mixes from the store. Homemade mixes are less expensive too! Recently I was looking for an au jus mix to make for French Dip sandwiches to replace the McCormick mix I usually buy, and I found this great recipe for homemade au jus. French Dip sandwiches are a great easy meal to make on nights when you don’t have very much time to make dinner. All you need are some hoagie rolls, sliced roast beef, and some au jus to dip the sandwich in. 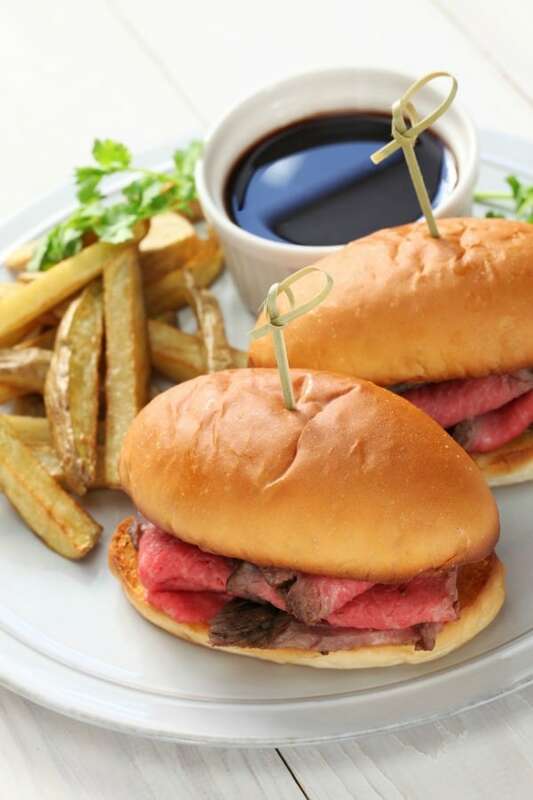 In the case of French dip sandwiches, however, au jus is usually made without beef drippings, especially if you are trying to use up leftover meat. 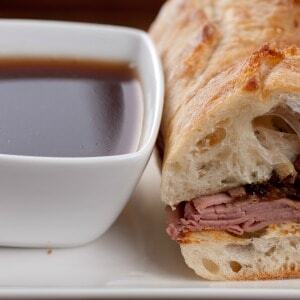 People generally buy a store bought beef au jus mix from Walmart to prepare their au jus for French dip sandwiches. Two different Los Angeles restaurants apparently have claimed to have invented French dip sandwiches in the early 20th century. One claims to have invented them in 1908, and the other in 1918. Regardless of the true inventor the French dip sandwich, it is apparent that dipping beef sandwiches in au jus is indeed an American tradition. Even the best store bought au jus mix does not live up to a homemade mix. Here is an easy au jus mix without MSG you can make ahead of time to have on hand the next time you want to make French dip sandwiches. Note: if you are looking for this recipe to be all natural and preservative free, most beef bouillon cubes contain MSG and/or other additives and preservatives. 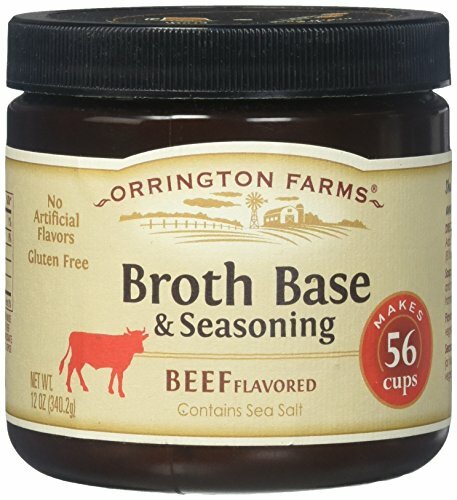 If you are looking for an all natural alternative, Orrington offers beef flavored bouillon that is all natural and MSG and preservative free. This brand costs (a little) more, but if you are looking for all natural alternatives, this may be what you are looking for. It is available at Amazon. Place all of the above ingredients in a blender or food processor. Process until the mixture turns into a fine powder. Store mix in an airtight jar or ziploc bag. To prepare the au jus, mix 4 1/2 tsp. of the au jus mix with 2 cups water and heat in a medium sauce pan for about 15 minutes until heated and slightly thickened. Serve. Note: 4 1/2 tsp. is equal to one McCormick french dip au jus mix packet that you would buy at Walmart. If you are wondering if you can freeze au jus, yes you can! Just freeze any leftovers in freezer containers like these inexpensive freezer containers you can order from Amazon. Leftover au jus will also keep in the refrigerator for up to a week. Follow my Mixes from Scratch board on Pinterest. 8 Comments on "Homemade Au Jus Mix"
I used to add it to my beef stroganoff sauce. Add 1tsp of Werchershire sauce to the au jus. It gives it a great taste. How many packets would this recipe equal please? Thanks! Hi! I haven’t measured it, but 4 1/2 tsp. equals one packet of au jus mix. I’m guessing maybe about 5 packets? If you would like your sauce to taste more like the fancy restaurants sub 1 cup of water with 1 cup strong black coffee. Hi! Most people use au jus sauce to dip roast beef sandwiches into. It’s delicious! Add to a roast in the crock pot with other “Mississippi Roast” recipes!